Watching the Brew Crew workout on a perfect day for baseball. Seeing the infield of Aramis Ramirez, Alex Gonzalez, Rickie Weeks, and Mat Gamel in action will set the pitching staff at ease. The Brewers have dramatically improved their infield defense. Gamel has good range and is in fantastic shape. 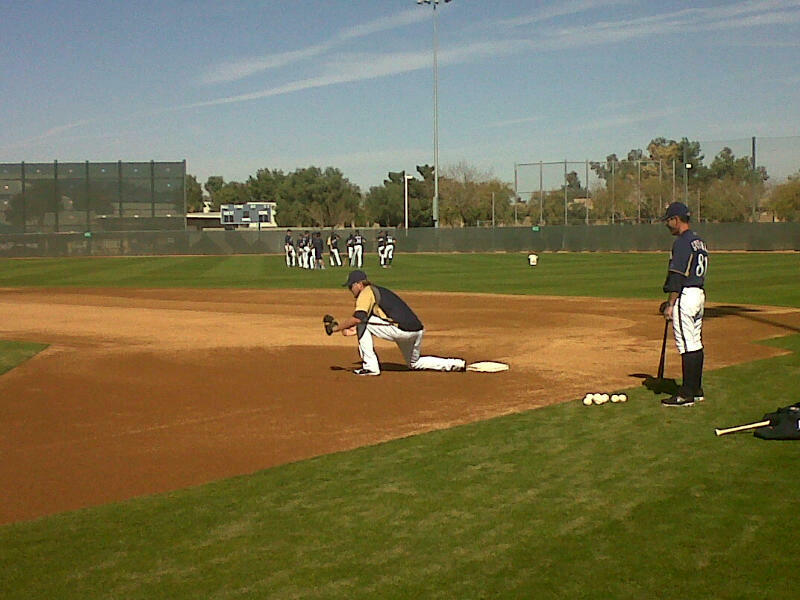 There was even a Corey Hart sighting at 1B today. Hart was considered a plus defender at 1B in the minors. Judging by the commentary of the coaches during this session, they are very pleased with his re-acclimation to the position. He looked like he belonged. Ha…remember that slogan? That’s what I tell my family when I have work to do. Today, my “off-season” ends. It’s my final day in Wisconsin until Opening Day. As mild as the winter has been here this year, I’m still eager to get to sunny, 70 degrees and some baseball! It was an off-season that got off to a late start (thank goodness) as the Brew Crew played through the third week of October. It’s an honor to have been able to call the Brewers recent playoff runs (’08 and ’11). I’m even more proud that Miller Park and Milwaukee, Wisconsin was exposed to the country in all it’s glory. Milwaukee is a baseball hotbed and everywhere I go, people ask me about it. Soon after the NLCS, the Brewers approached me about an extension. What a blessing. I love living and working here. My family and I didn’t know a soul when we moved here in ’07. We have made a life here an I’m excited to plant deeper roots. Having spent nine years in the Minor Leagues, I know how rare job security is in this business and it’s not something I take for granted. I lived on Denny’s and Days Inn’s for way too long. I gladly accepted the offer (4 year extension). Rock is signed long-term as well so you’re stuck with us for a while. The new deal will allow me to continue working for Turner Sports during the MLB season and postseason. I’ll continue working for Big Ten Network as long as they’ll have me and recently, I accepted an offer to join Turner/CBS Sports. I’ll be covering NCAA basketball the next two weekends along with the 2nd/3rd rounds of the NCAA Tournament next month. I enjoy calling games on a national stage and I enjoy calling games for the Brew Crew. I’m glad my bosses allow me to do both. Thank you, bosses. I enjoyed the On Deck event this past January along with my normal appearances with Doug Melvin. I also helped put together a non-profit called The Point www.whatsthepoint.net. Hello everyone…it’s good to be back in the House of Blogs. Pitchers and Catchers report tomorrow so I thought I’d beat ’em by a day…from my couch in Wisconsin. First off, let’s get this out of the way…I have no idea how the Ryan Braun situation will play out. I have been asked that question everyday since December 10th and I know nothing. 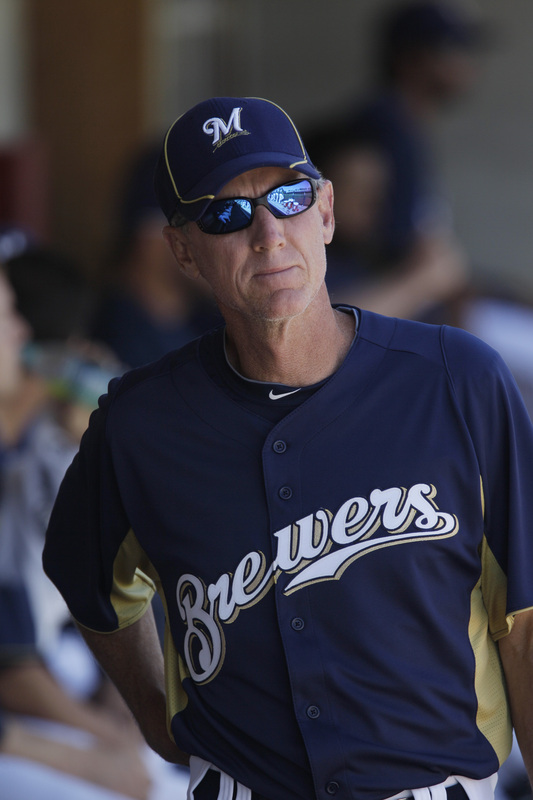 Roenicke’s sporting the shades – must be Spring Training time again. Regardless, I do think the Brewers are going to be very good in 2012. The game is trending back to it’s beautiful roots, pitching and defense reign. The Crew returns a deep, balanced pitching staff and an improved defense. I believe the Reds will present the biggest challenge in the Central Division. The Cardinals will be in the picture if Adam Wainwright returns healthy. I spoke to Ron Roenicke yesterday and he seems as confident as ever. He’s a man of few words but a master communicator. Nothing phases him and nothing gets by him. To that point, last year, Rock and I were hosting a “thank you” dinner for the TV crew before a September home game. Ron seemed intrigued so I flippantly suggested he stop by, never dreaming he would. He responded, very seriously, that he’d like to. So here is a big league manager, in the heat of a pennant race, wanting to address our crew of 50 or so in the South Dock service entrance at Miller Park. He thanked them for their contributions to the organization and spoke about teamwork and embracing your role for the betterment of the group. I do not have the hard data, but I can say with 99.9% certainty that this was the first time in the history of baseball that a manager addressed a TV crew in this manner. It was jaw-dropping impressive and it left a mark on a group of men and women who work very hard, with very little credit, to be great bringing the Brewers into your living room. Ron and the rest of the coaching staff report to Maryvale today. Ed Sedar is in charge of camp for the second consecutive season and what happens in Arizona will set the tone for the rest of the season. Players want to know if they can trust the manager and coaches and believe it or not, Spring Training organization speaks volumes.